Insurance is one of those things in life that is sometimes painful to pay for, but is at the same time an absolute necessity. Unfortunately, in life there’ll be a day when weather hits hard, you come down with an illness, have a car wreck, or possibly experience a house fire. When that happens, you’ll be glad you have insurance, I used to be one of those who used to think having insurance was not necessary until I found the specialist insurance from quotesearcher.co.uk, they made me realize how much people need a back up. Although you’re required to purchase health and car insurance, there’s an array of other insurance options available too. Everything from cancer insurance, to identity theft insurance, to pet insurance that you might question if you should purchase as well. With all the options, it can be difficult to know what you really need. Here are five types of supplemental insurance and how to know if they’re right for you. If you have a furry companion in your family, you know how beloved and special they can be. You probably also know how expensive veterinary bills can be, whether it be basic check-ups, medications, or even surgeries. Like your own health insurance, pet insurance can help take care of some of those costs and provide you with more affordable prescriptions as well. That being said, pet insurance doesn’t work the same way yours does. Instead of paying up front, it simply reimburses you after you’ve already paid the bill. Whether or not you should purchase pet insurance is really up to you and your financial situation. If you’d do anything for your pet, it might be a wise decision to assist you should you have to pay for an expensive surgery or treatment. This is especially true if you know you couldn’t afford said treatment on your own. That being said, if you do decide to buy pet insurance, be sure to compare rates, costs, and deductibles at various companies before deciding. In our digital world, most people can’t stand the thought of being without their phones for any prolonged period of time. Unfortunately, however, our mobile phones are anything but indestructible. Whether you’re simply clumsy with your phone yourself, are prone to water spills, have experienced power surges, or ever had your phone lost or stolen, you know the panicky and sometimes helpless feeling that goes along with being involuntarily unplugged. Thankfully, insurance companies and cell carriers realize we are reliance on our devices. Thus, they have rolled out mobile phone insurance, which covers pretty much anything that might happen to your phone. Most policies provide about $1,000 of coverage that will likely cost you $59 annually with deductibles ranging $35 to $70. If you’ve gone through multiple phones in your life, unintentionally that is, cell phone insurance might be a purchase that saves you big in the long run. One of the biggest crime waves of the twenty-first century is identity theft. There’s an array of ways in which people gain access to your credit card, store, and bank accounts, and valuable personal information. Unfortunately, once someone gains control of those items, they can cause serious damage to your credit, finances, and reputation. It’s in no way an easy problem to come back from. The road to financial recovery is often a long one. Identity theft insurance provides you with someone who can help set your life back in order should your information ever be breached. Nonetheless, it’s really up to you whether or not you think you need it. If you’ve been in a similar situation before and it provides you with peace of mind, it might be worth the cost. That being said, there are steps you can take on your own to reduce your risk. You can try setting up alerts, consistently reviewing your accounts, and destroying anything that could leave you vulnerable. If that alone leaves you feeling protected, then the cost may not be worth it. Vacations are supposed to be relaxing and fun experiences, however, life happens and there are lots of things that can go wrong on a trip. Travel plans can go awry, belongings can be lost or stolen, or you could have a medical emergency while away. Travel insurance can help assist you should any of these problems arise. It’ll cover the cost of re-book a flight, replace any belongings, and assist in medical costs. When you’ve already spent a fair amount on a trip, having to cover the costs of any of these things can really hurt your bank account. Weigh the costs of travel coverage with the cost of what you could potentially lose; these things are often out of our control, which is why having coverage can be a life-saver. Still, there are plenty of people that travel sans insurance. At the end of the day, if you feel it’s unnecessary, then it may not be something you opt for. If you drive used cars, then this is one kind of insurance you can skip right over. However, if you love having a new car, whether you own or lease it, then GAP (Guaranteed Auto Protection) insurance can help you save in the long run. As you likely know, if you’ve ever purchased a new vehicle, the moment you drive it off the lot it’s value quickly depreciates, and often by a hefty amount. That being the case, should you have to sell it quickly or get in an accident, GAP insurance can help cover the amount between what you actually owe and what your car is now worth. Again, if used cars are for you then there’s no need to consider this one. But, if buying new is your forte, it’s something you should definitely consider. With the variety of insurance plans out there, it can be difficult to know what you really need coverage for. And while some plans are worth the cost, there are others that only exist to get you to spend extra money. Carefully consider your situation and whether or not the coverage actually makes sense for your life before opting for any supplemental insurance plans. 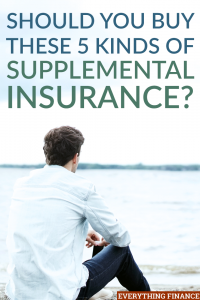 Do you have any of these supplemental insurance plans? If so, have you found them to be helpful?